Oil prices turned negative amid a sell-off in the U.S stock market and renewed dollar strength, which makes crude more expensive in emerging markets. U.S. crude fell for an 11th straight day, posting its longest longest losing streak on record. Crude futures fell despite growing signs that OPEC and its allies are moving towards a fresh round of production cuts aimed at preventing oversupply. Oil prices turned negative amid a sell-off in the U.S stock market on Monday, with U.S. crude posting an 11th straight day of losses, its longest longest losing streak on record. Crude futures looked set to break the streak earlier on Monday after Saudi energy minister Khalid al Falih said OPEC and its allies may need to cut crude production by about 1 million barrels per day to prevent the market from swinging into oversupply. On Sunday, Falih said the kingdom's shipments would fall by 500,000 bpd in December. But the recent strong correlation between stocks and crude futures reasserted itself on Monday as the Dow Jones Industrial Average fell 600 points. "The stock market was pulling at the oil complex all day. We should have gotten more of rally at that Saudi commentary over the weekend," said John Kilduff, founding partner at energy hedge fund Again Capital. 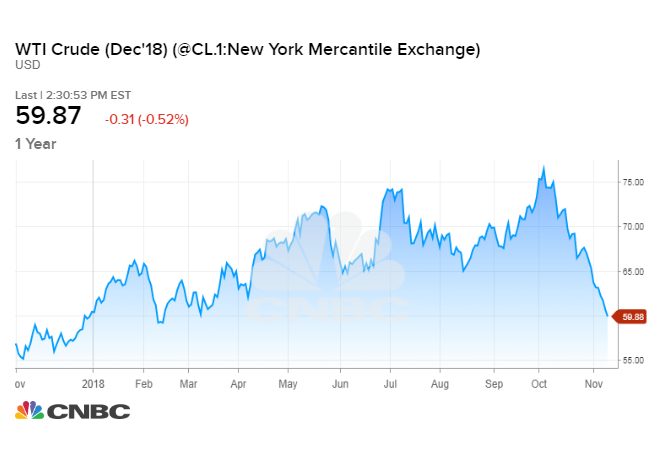 The losses continued after the settlement, with WTI falling more than 2 percent and dipping below $59 a barrel for the first time since February. Brent crude, the international benchmark for oil prices, settled 6 cents lower at $70.12 on Monday. Brent briefly dipped below $69 to its lowest level since April in post-settlement trade. Crude futures have pulled back sharply during the last five weeks, as oil got swept up in October's market sell-off that saw investors shed risk assets. Rising oil supplies from the United States, OPEC and Russia and forecasts for weaker-than-expected demand growth have kept pressure on the market. "It does look like demand is starting to come off a bit," BP CEO Bob Dudley told CNBC at the ADIPEC oil and gas conference in Abu Dhabi on Monday. The world's appetite for oil now looks set to grow by about 1.3 million bpd, compared with BP's earlier expectations for 1.4 million to 1.5 million bpd of growth, Dudley said. Compounding concerns about demand, the U.S. dollar hit a 16-month peak on Monday. A stronger greenback makes dollar-denominated oil more expensive to holders of other currencies. Currency weakness in emerging markets has significantly increased the cost of crude in those countries, raising questions about future demand. However, a committee tasked with monitoring the group's production agreement concluded on Sunday that oil supplies are growing faster than demand requires, threatening to leave the market oversupplied.The Joint Ministerial Monitoring Committee said the current oil market situation "may require new strategies to balance the market," after warning last month that the group may have to reverse course and begin cutting output once again. "If all things remain equal, and they almost certainly will not as things will change — it is a dynamic market — then the technical analysis we saw yesterday … tells us that there will need to be a reduction of supply from October levels approaching a million barrels," Falih told the crowd at ADIPEC on Monday. "Hopefully, Saudi Arabia and OPEC will not be cutting oil production. Oil prices should be much lower based on supply!" he wrote on Twitter. Russia, the world's second biggest producer and an influential voice inside the alliance, is signaling some opposition to supply cuts. Russian Energy Minister Alexander Novak said Sunday he wasn't sure the oil market would be oversupplied next year. He told CNBC crude prices remains volatile. "Therefore, right now we shouldn't be making any hasty decisions," Novak said. "We need to look at the situation very carefully to see how it will develop so that we don't end up changing our course by 180 degrees every month." OPEC is scheduled to release its monthly production report on Tuesday, which will detail the group's October output. In September, the 15-member cartel pumped nearly 32.8 million barrels per day. The United States recently topped Russia as the world's biggest oil producer. The country is now producing about 11.6 million barrels per day, more than 10 percent of global demand, according to the latest preliminary weekly figures.